Another new poster for "Friday the 13th" has found it's way on to the internet and is it ever exciting. It is simple, bold, and daunting! 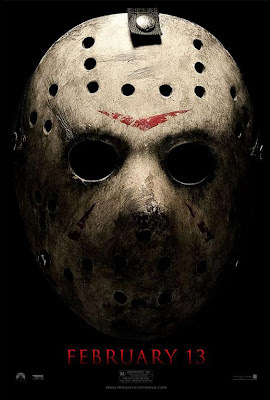 Jason Vorhees looks to be one hell of a badass in the new remake from Platinum Dunes and this poster shows that Jason isn't to careful with his mask, it definately has had some wear and tear. The remake looks to have nailed the original concept and taken it a step further. It actually looks scary! In my book Febraury 13th cannot come quick enough...bring on the splatter! Scroll down to see the rest of the new poster.